After a handful of perfect days exploring Tuscany and relaxing in our amazing villa, I was kind of looking forward to Florence but had already given it a status of ‘second-best’ before we’d even arrived. Why? Because I’m usually not as impressed with the big cities and much prefer quaint historic towns like Lucca. But, my brother Reece raves about Florence, it’s his most favourite place. He actually lived there for the summer as an art student. He also speaks pretty good Italian, but is way too modest to admit it. We were all suitably impressed and really noticed the difference it made. The Italians are always welcoming and happy, but when one of your group speaks the language they are even more so! Florence truly is a city of magic and I was blown away by its architecture, my opinion changing the more we explored. Keen to explore, and keen to totally immerse ourselves in Italy we walked all day around the sandstone streets marvelling at the scale of everything and stopping off for the odd espresso to fuel us up. Sitting by by the river Arne watching the boats skim along the river whilst admiring Ponte Vecchio was something everyone needs to experience. Its all beautiful, but if I had to pick just one thing to make a fuss over it would have to be ‘Il Duomo di Firenze’; Florence’s Cathedral. Its stunningly exquisite and kind of takes your breath away. I didn’t expect it to be so big, or so detailed! It’s probably, and this takes some beating, one of the most beautiful buildings I’ve ever seen. Every angle is impressive, it glistens in all lights with shades of pink and green and white marble. You can stand and marvel…or gawp, from any direction and it will always be impressive. We were lucky and the queue to go in was tiny. Reece commented on how unusual this was so we quickly took advantage and made our way inside. Calm, cool and quiet. Candles keep the atmosphere warm and welcoming. Taking advantage of our tour guide, sorry, my brothers knowledge of Florence, we learnt that the cathedral was finished in the mid 14th century without a roof under the presumption that one day someone else would be able to dome it! This is when Filippo Brunelleschi entered and his solution was two concentric shells (so there is actually two domes – an inner and outer) which took a whopping 16 years to complete using no scaffolding, (which was revolutionary) and instead he used a brick laying method (called the Herringbone bond) that provided support as it dried. The part that really took my breath away was the ‘The Last Judgement’ commissioned by Vasari in 1572. Vasari died only having carried out half of the work so a new artist called Federico Zuccari was called from Urbino to finished the work. He technically ruined Vasari’s plans too using a much more simple method of painting. The frescoes (thanks to Reece for teaching us the lingo) were then scrupulouslyrestored between 1978 – 1985. It’s truly impeccable and photo’s don’t do it justice. There’s only one thing for it… you have to go! The streets of Florence are always busy. It all adds to the excitement and utter chaos, the echoing noise of chatter and if you pretend the selfie sticks aren’t there, it gives you an idea of the busy streets of the past. Just picture it. My brother pointed out his student digs conveniently opposite Mercato Centrale – two jam-packed floors of foodie heaven. Heading straight upstairs it’s bursting with restaurants and things to eat. I wasn’t particularly hungry.. shock, horror i know… so I settled for some fresh vegetable tempura. Don’t be put off by how busy it is, the people move fast and the classically simple kitchens churn out some of the best spaghetti and snacks in Florence. 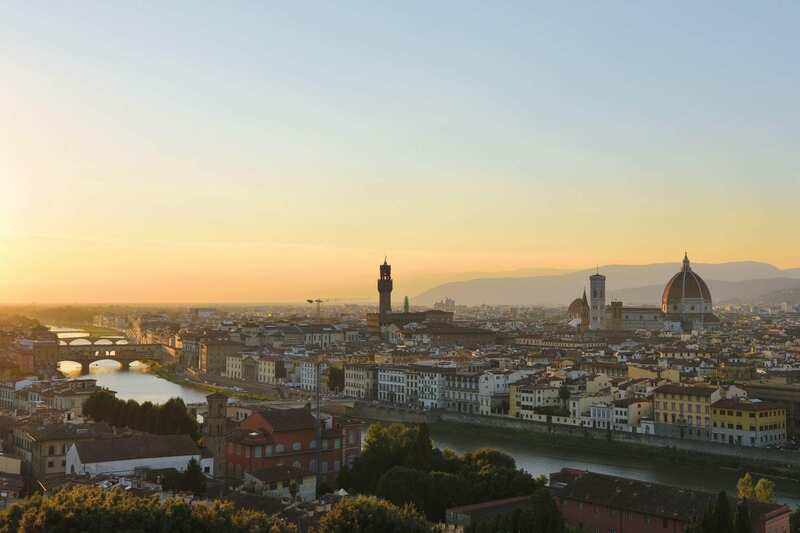 Renowned for its high-brow art scene and architecture Florence also has the most amazing sunsets. I’d been told that the only way to enjoy it was at a fancy rooftop cocktail bar. Reece soon knocked that on the head when he told us that actually, the best way to view the sunset is to follow the locals up to the highest point in Florence at Piazzale Michelangelo. I won’t lie, if you’re unfit it’s an effort but totally worth it for the panoramic views. We grabbed some cold Italian lager with some cups and climbed our way up. When you get to the top you’ll know. There are people everywhere! But keep on going a bit higher up some more steps (sorry) just to the right of the restaurant. It’s a bit quieter and there’s lots more room. We perched on some steps at the top and absorbed it all. The perfect way to spend our last evening in Italy. Oh.. and if you’re wedding venue hunting… ta-da! Can you just imagine? "A Day Out in Pisa, Italy"
And just perfect for a wedding anniversary too! Another bucket list destination! I keep putting holiday time aside and I need to get organised and start saving money!!!! lol. Awesome photos, what a great place! Beautiful photos, they really feel like they take me there… I’d love to go to some place like this so I can be lost in the buildings and atmosphere. It’s fascinating! I can’t wait to go back to Italy. We fell in love with Florence too. The atmosphere there was laid back, the people were so nice. It was just an amazing experience of a beautiful country. OMW! This post is truly amazing. Love the photos they all great captures and love the history that you provided. Definitely will have to try go there to experience the magic of Florence. I am already in love with this place from your photos and what a gorgeous beauty with so much every building has there to say. Gorgeous photos! Florence is definitely on my travel bucket list! Oh wow all these pictures are stunning, every single one! I love how bright and vibrant everything looks. I’ve always wanted to go to Italy! Il Duomo di Firenze looks magnificent, there’s so many fine details to get lost in! I want to go to Italy & Florence is on my list. The photos are beautiful! Il Duomo di Firenze is stunning just in pictures, so I can only imagine how much more stunning it is in person. It looks like it’d be worth climbing all those steps for a perfect view of that sunset. Oh my my my! I have always loved Italy (it’s my daughters name lol) I can not wait for the day I get to travel to Italy and experience it first hand! It looks like you had an amazing time. This place looks so dreamy! I would love to travel here one day! Oh Gosh! You have been booking tickets right away. The pictures looks SO good. The architecture alone is a good reason to go. My dad visited Florence a few years back and he was mesmerized by its architecture. It’s on my bucket list for quite some time. Just waiting for my kids to grow up. Beautiful pics in this post. Omg Florence is beautiful!! You are so lucky to have visited this beautiful place! I love all of the architecture. Looks like a fabulous trip! I love the architectural details and paintings in Italy. I’d love to visit in person someday! Thanks for sharing your experience. My cousin visited Florence last month and she was really amazed with and the architecture of the buildings. I will definitely put this on my bucket list. I love love Florence! Its the most magical place ever! It had been on my bucket list since so long and we finally crossed it off a few weeks back! We passed on Florence in favour of Siena when we recently went to Tuscany but now looking at your gorgeous photos I think we missed out. It sounds and looks stunning! It looks so beautiful and that food looks amazing too! Those pictures are just stunning….I’m just a tad envious! I’ve been seeing some lovely photographs on Instagram this week as well, so it’s really making me want to book a visit! Ah, this made me miss Florence!! Duomo really is stunning, but so is everything about that city 🙂 Need to go back asap!! I have just returned from Tuscany, after spending a month there and I loved Florence as well. There are so many things to see and do there, so much good food as well. No wonder it makes you fall in love with it.